You recently won World’s Best Single Malt in the World Whiskies Awards 2016 for Old Pulteney Vintage 1989 – tell us more about this particular expression and why you think it is deserving of the coveted title? Give us a brief history of Old Pulteney whisky and the Pulteney Distillery. Tell us more about your involvement in the Maritime Heroes Awards and how your commitment to sailing communities helps to strengthen the brand. Pulteney Distillery is one of the most northerly distilleries on the Scottish mainland. It was founded in Wick in 1826 at the height of the coastal town’s herring boom and it is this unique seafaring heritage that gives the whisky its identity as the ‘Maritime Malt’. To pay homage to its long standing association with the sea, Old Pulteney supports a year-round programme of maritime activity, including the successful annual Maritime Heroes Awards which is now in its fifth year. We created the awards to recognise and celebrate the outstanding passion, commitment and achievements within British maritime communities and it is this grassroots approach that has really resonated with worldwide sailing communities and helped to develop loyalty to the brand. What do you think differentiates your single malts from others on the market? Old Pulteney’s rich maritime history, distinctively designed bottle and multi-award winning taste sets it apart from other single malt’s on the market. In fact many whisky enthusiasts say that they can taste a faint hint of the sea in Old Pulteney thanks to the distillery’s windswept location and close proximity to the North Sea. In what regions, countries, markets are your products available and who distributes them? Are they available in both the on and off -trade? Old Pulteney is available in both the on and off-trade and our 12 Year Old is currently No 8 in the UK off trade sector (source AC Nielsen 2015). In addition, our whisky is currently number 17 in global travel retail and is currently the fastest growing single malt in the category. What size is the company in terms of turnover/people/sales? 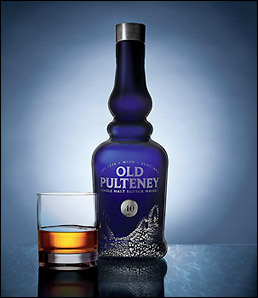 Old Pulteney is a flagship brand from Airdrie-based company Inver House Distillers, the Scotch Whisky subsidiary of global drinks business International Beverage Holdings Ltd. Inver House’s profits for the 2014 year to December were £79.2 million and were led by the growth of its focus brands, Old Pulteney, anCnoc, Balblair and Speyburn single malts, and from premium blend Hankey Bannister and super premium gin Caorunn. The business employs over 200 people across its six sites in Scotland. The labels and packaging designs of your brands make them instantly recognisable as they aim to reflect the maritime heritage of the company – explain a bit about the branding of your products. Every aspect of Old Pulteney’s eye-catching packaging was designed to embody Wick, its people and its remarkable history. The Distillery’s uniquely shaped Pulteney stills are reflected in the design of the Old Pulteney bottle shape, whilst all our packaging carries a classic herring drifter design, which has become a symbol of the brand. Do you use a design agency – national or local? We work closely with a few Scottish design agencies who really understand our brand. How important do you think the packaging / label design is to the success of a whisky and why? We believe that packaging and label design is incredibly important to the success of a whisky. Not only should great packaging bring greater visibility and appeal, it should also reflect the quality of the whisky inside and communicate its rich heritage and identity, factors which have become of increasing importance to whisky drinkers. Where and how do you see future growth for your business? What exciting new products can we look forward to for 2016?